Random Audio Sample: Bash : guitar solo by Ken Murray, from the CD Re-sound. Ken Murray performs regularly alongside Australia's foremost exponent of Brazilian music, Doug de Vries. 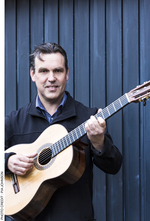 He has performed with many ensembles as a guitarist and mandolinist, including: Elision, Libra, re-sound, the Adelaide Symphony Orchestra, the Melbourne Symphony Orchestra and Orchestra Victoria. He has collaborated in duos with musicians such as Jeannie Marsh (voice), Hartley Newnham (voice), Silve Leprohon (flute), Laila Engle (flute) and guitarists: Oscar Flecha (Portugal), Geoffrey Morris and Owen Thomson. Murray has written a variety of works for guitar in solo and ensemble settings. His works have been commissioned by the Santo Tirso International Guitar Festival and the Suzuki Association of Victoria. Santiago : for guitar ensemble (2009) Commissioned by Leah Riordan.